"When I decided to retire, I knew I wanted two things from my investment strategy: dependable, regular income and the opportunity to grow annual income in pace with inflation. I found that typical strategies could deliver one or the other but not both"
SAN FRANCISCO--(BUSINESS WIRE)--With investors focused on the importance of generating income for today’s needs while growing their nest eggs for the future, Charles Schwab has introduced ThomasPartners™, a dividend income-focused money management strategy newly available for Schwab retail clients and its independent Registered Investment Advisor (RIA) clients. Last December, Schwab acquired the Wellesley, Massachusetts, money management firm, which uses a growth-oriented investment portfolio to generate dividend income streams. At the heart of the ThomasPartners approach is equity investments in companies that, even in down markets, have consistently paid their shareholders regular dividends and have generally grown those dividends year over year. According to ThomasPartners research*, between 1973 and 2012, stocks that grew or initiated a dividend had an annualized performance of 13.32 percent versus 7.41 percent for non-dividend payers. ThomasPartners provides a disciplined approach through diversified equity holdings to help mitigate the risk of overexposure to any specific asset category or industry. The strategy uses rigorous selection criteria and actively monitors and manages its portfolio holdings to maintain broad exposure to domestic and international common stocks across a range of equity asset categories. ThomasPartners also offers significant value to investors. For retail investors, the ThomasPartners strategy has an investment minimum of $100,000 and pricing starts at 90 basis points per year (.90 percent). While 55 percent of respondents to Schwab’s survey say that dividend stocks or capital gains account for at least a portion of their retirement income plan, additional findings suggest that people don’t traditionally think about stock dividends as a retirement income strategy. Only 26 percent say that their broker or financial advisor has raised the topic of stock dividends as part of a retirement income plan, and just 14 percent of people have brought up this topic proactively themselves. Schwab’s survey also found that 89 percent of investors consider it very important to have an investment strategy in place to help guard against market volatility. The launch of ThomasPartners is the latest addition to Schwab’s line-up of advised solutions joining Schwab Managed Portfolios™-Mutual Funds, Schwab Managed Portfolios™-ETFs, Windhaven Portfolios™, Schwab Private Client™, Managed Account Select and Managed Account Connection and Schwab Advisor Network®, which connects investors who have complex wealth management needs to local independent investment advisors. Total assets under management in Schwab’s advised solutions stood at more than $135 billion as of April 30, 2013. Portfolio management is provided by ThomasPartners, Inc. (“ThomasPartners”), a registered investment advisor and an affiliate of Charles Schwab & Co., Inc. (“Schwab”). Both versions of the ThomasPartners Dividend Growth Strategy are available through the Schwab Managed Account Connection® (“Connection”) program. Please read Schwab’s disclosure brochure for important information and disclosures relating to Connection and Schwab Managed Account Services™. Schwab makes available other equity strategies in its managed account programs that focus on dividend-paying stocks, including strategies that are managed by firms that are unaffiliated with Schwab. *Source: ThomasPartners research with data from the CRSP® 1962 U.S. Stock Database. ©2012 Center for Research in Security Prices (CRSP). Includes all publicly traded U.S. companies with market capitalization of at least $1 billion (in today’s dollars), adjusted historically for inflation. Beginning in 1972, membership in each dividend classification is set as of December 31 for each year, and then held constant for the next 12-month period. Dividend Growers and Initiators include stocks that initiated or increased their dividend during the previous 12 months. No-Change stocks are those that maintained their existing per-share cash dividend over the previous 12 months. Dividend Cutters and Eliminators are companies that lowered or eliminated their dividend at some point in the previous 12 months. Dividend Non-Payers are companies that did not pay a dividend at any time in the previous 12 months. The average return is the compound annualized average return for the 1972-2012 timeframe. **The survey was conducted by Koski Research among a geographically dispersed U.S. panel of 1,000 people ages 55-75 with $250,000 or more in assets from April 20 to April 26, 2013. Margin of error is approximately +/- 3.1%. ***Based on a hypothetical $1 million initial investment on 3/31/03. Income growth during certain periods may have been flat or negative. Past performance is not indicative of future results; the value of investments and the income derived from them can go down as well as up. Future returns are not guaranteed, and a loss of principal may occur. Please refer to ThomasPartners Form ADV, Part 2A, for more information. There are risks associated with any investment approach, and the ThomasPartners Dividend Growth Strategy has its own set of risks. First, there are the risks associated with investing in dividend-paying stocks, including but not limited to the risk that stocks in the strategy may reduce or stop paying dividends, affecting the strategy’s ability to generate income. Second, investor sentiment could cause dividend-paying equities to fall out of favor or price earnings multiples to compress. Please discuss this and other potential risks with your Financial Consultant prior to investing. The composite and index information shown above is based on historical performance, does not account for taxes, and assumes reinvestment of dividends. Additionally, the composite and index returns are total returns, not just price-only returns. 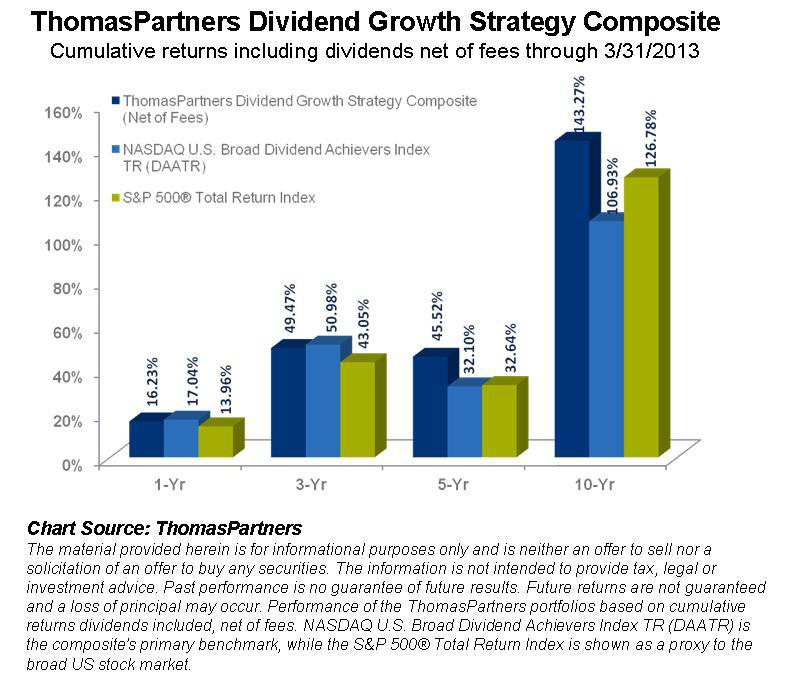 The ThomasPartners Dividend Growth Strategy Composite income shown is a combination of the annualized dividend yield at each indicated point in time and the returns earned on the strategy since the inception date. The dividend yield is the last dividend paid divided by the price of the stock on that pay date, which is then annualized. There is no guarantee that a stock will continue paying a dividend in the future, or that the yield will remain the same or increase, as cash dividends and stock prices change over time. The ThomasPartners Dividend Growth Strategy as shown is not available for direct investment, and it includes accounts from the ThomasPartners Dividend Growth K-1 Generating and Dividend Growth Non-K-1 Generating versions of the strategy. Actual performance of these two versions of the strategy may vary from that of the overall Dividend Growth Strategy Composite. Please note that there are material differences between the indexes shown, including potential differences in holdings and in how each calculates dividend yield. ThomasPartners believes that although the S&P 500® Total Return Index does not seek dividend income as a primary objective, it is a suitable proxy for the overall market. The NASDAQ U.S. Broad Dividend Achievers Index TR (DAATR) comprises U.S.-accepted securities with at least 10 consecutive years of increasing annual regular dividend payments. The S&P 500 Total Return Index is a commonly recognized, market-capitalization-weighted index of 500 widely held equity securities, designed to measure broad U.S. equity performance. Indexes are unmanaged and cannot be invested directly.